Porcini mushrooms are a perfect complement to the taste of beer. They add a light, rich earthy flavor to the beer. These mushrooms grow from 7 to 25 cm across the cap which has a convex. It is smooth or wrinkly and is a yellow brown to reddish color. The outer cap is brownish in color and it does not have gills. This mushroom has thick white flesh with a mild aroma and flavor. The stem is up to 20 cm long and between 3 to 8 cm thick. Porcini mushrooms are native to Italy, found in the wilds of the countryside. You can also find them in the US, throughout Europe, New Zealand, and South Africa. Their natural environment is hardwood forests. Porcinis love growing in the litter around pine, spruce and chestnut trees. You can find them during spring and summer, and after heavy rain in autumn. It is a meaty mushroom with a rich taste of the wild. Porcini mushrooms are still not grown commercially so they can become very expensive to buy to add to a beer brew. You can grow porcini mushrooms yourself. Even dry what you have left over for future use. Porcini mushrooms from Italy taste amazing. They’re strictly regulated which can add to the costs. 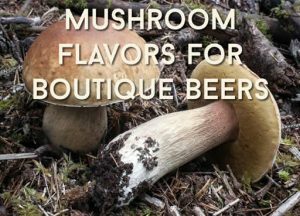 That’s why every mushroom brewer should seriously consider growing their own supply for brewing quality mushroom beers.